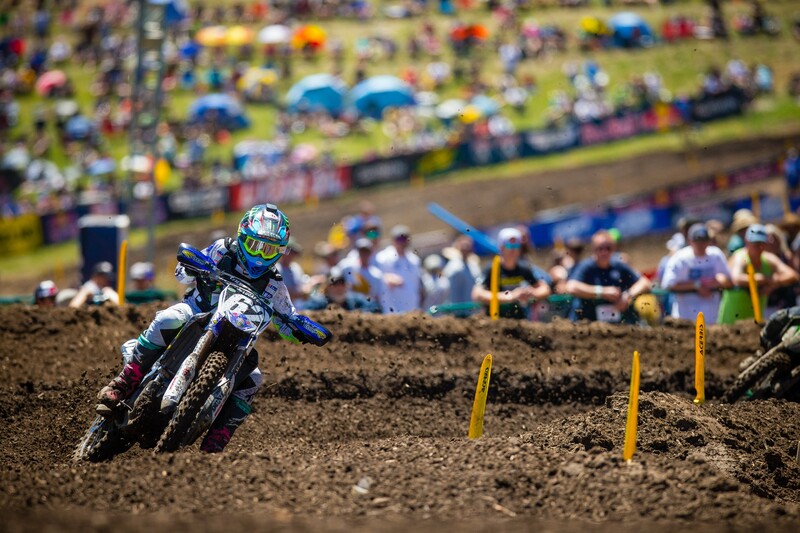 Racer X: Jeremy, you’re the third individual that now has control of the red plate. Take us through a bit of that emotion when you not only got the win, but found out you took over the points lead. Jeremy Martin: It was a pretty cool feeling. It’s been three years since I had the red plate. Kind of had goosebumps after that. Really enjoying the moment for having it. It’s a lot of struggles since I won my title in 2015. I was in a pretty big hole in 2016 and last year. We were able to dig ourselves out of it and get back to where I belong. Justin, another spectacular performance in an outdoor ride very early in your professional career. Again, you’ve had the big sensation of leading. Is it starting to get a little more comfortable for you up front? Justin Cooper: Yeah, I’m just taking my confidence into the season. I had a lot of pre-season training and I think it’s paying off. Just trying to take baby steps towards it. Not trying to rush anything and just letting things settle where they settle. Felt good the first moto. Felt good in practice. Second moto, I went out there and really had nothing to fight for. Was struggling with a little bit of sickness this week. The day went as good as it could have gone I think for me. Alex, it seems like you’ve found yourself up front a couple times this year. That guy right there is the one that kind of keeps taking it away. Did you rough him up too much when you were little kids? Did you pick on him or something? Alex Martin: Actually, yeah. I beat the crap out of him many, many times. This is probably my karma. No, honestly, Jeremy is probably the worst guy to have behind you in a second moto. He’s strong. He’s fit and he’s relentless. He’s going to be there until the very end. Unfortunately, he’s been behind me the last two weekends the second moto. I knew he was there. I was just focusing on myself and pushing and pushing, trying new lines here and there to try and get away from him. Eventually he went around the outside of me. Overall, I’m pretty happy with the weekend, 3-2. Second overall again two weekends in a row. Closer to the points lead now. We head back to the East Coast now, so I’m excited. Justin, talk about leading that first moto. Were you feeling the pressure back there, or were you comfortable up front? Cooper: To be honest, I was comfortable. I got a great start. Ripped the holeshot. I knew Joey [Savatgy] was there. He had a section where he was faster than me, but he started defending that one section every lap and he eventually got me in that section. I couldn’t figure it out. I felt good. I felt like I was riding my own pace. He was just following me around. He ended up making the pass, and then I don’t know what happened to his bike. I got lucky, but I’ll take it how I can get it. Justin, I know you got onto the box at Unadilla last year when it was super rainy and muddy and everything. Do you feel now that you’ve kind of proven whether it’s muddy and wet or dry and dusty, that you’ve got what it takes? Cooper: Yeah. I’m from upstate New York, so I’m used to that stuff and riding in the mud. I like that. I think I excel at it more than other people. Definitely can do it in all conditions. I felt good today. First practice was muddy and I felt really good. I think I qualified first in that one. I qualified third overall and just kind of set the tone for the day to have a really good day and a solid day. That’s what it’s all about. Just don’t want to do anything stupid out there. Jeremy, you and your brother have battled a ton. How serious was the battle in that second moto? It looked like you were both going for it. J. Martin: Yeah. We battled second moto at Glen Helen last weekend and made some contact. I called him mid-week, like, “Dude, you gave me a bruise on my arm!” Then we battled again today. He said I couldn’t pass very well, but I blew his doors off on the outside. I was really proud of him. He was riding really fast. It’s pretty cool that you have two brothers from the same family battling like that. It’s really cool. Out of everyone that I like to battle with, he’s probably my favorite. I got him to look over at me a couple times. It was a good day. Jeremy, do you feel like we’ve had a little change in the style of the tracks? It seems like they’ve let hard pack be hard pack for the first three rounds. J. Martin: Yeah, for sure. I’ve been pretty disappointed with the track prep at the first three rounds so far. This is the great outdoors. It’s supposed to be gnarly, rough, and deep, and it’s definitely been smoother and just choppy and not as many ruts. I think today was definitely soft, and it was kind of mushy in the beginning. It formed in better for the motos, I would say. It worked out. Justin, first when you saw Joey on the side of the track, what was going through your mind? Second, I know if you could bottle it, we’d all buy it, but what was that feeling on that last lap when you knew you were about to win your first moto? Cooper: I came off the drop off and I saw Joey. He looked like he was going a little slower than usual. Just sitting on the bike, rolling through the braking bumps. I was like, wow. Then once I got closer, obviously I realized something was wrong with his bike. I think I had two laps to go from there on out. I had a pretty solid lead at that point, so it was pretty nice. I had a cushion and I could ride it to the checkered flag and take a little bit of a parade lap the last one. Justin, you’ve been great in the first three rounds. Your first motos have been better. Is that just the way the second motos are kind of unfolding, or is there something you can point to as to why you’ve been better in the first motos? 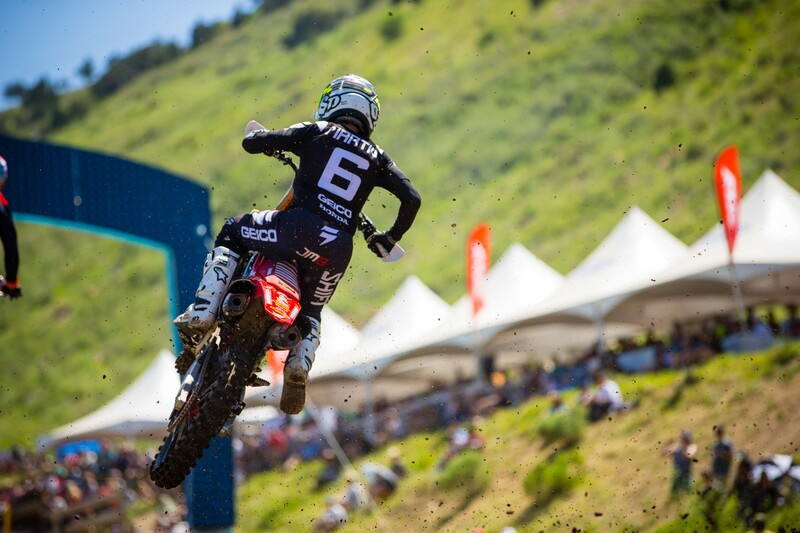 Cooper: I think I definitely need a little bit more fitness in the second motos. It’s kind of unfair to say that just with how my week’s been. I’ve been really sick and still lingering a little bit. I had a fever after the first moto. Just felt pretty drained after the first moto, which is how it should be. 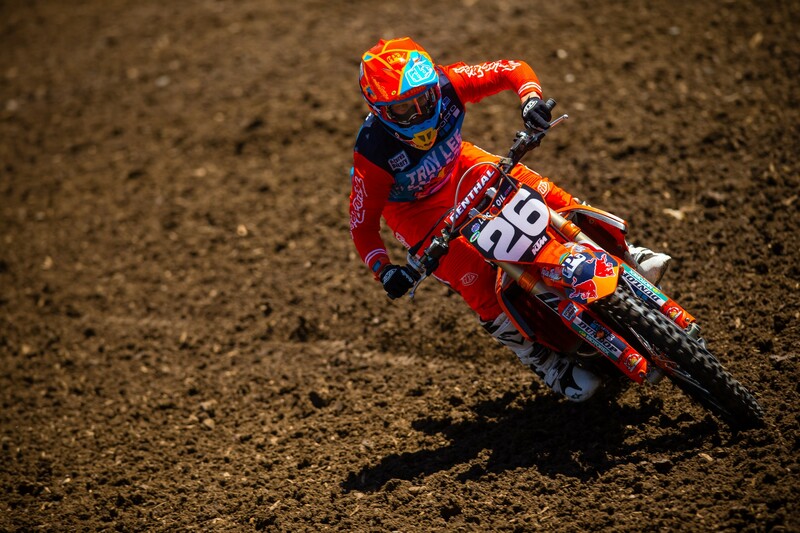 If you’re going for the moto win, you’re going to be tired after it. I think we’ll be ready to go for the next one. We were strong at Glen Helen—two solid motos, but just struggled on the starts a little bit there. I think once we get healthy again, we’ll be fine for two motos. Jeremy and Alex, with Ryan Dungey having retired, you guys are the top contenders for Minnesota right now and have a lot of people back home looking at you. Who are we going to see between the two of you with the championship coming up, and the first one with the 450 down the road? J. Martin: It’s definitely going to be a battle with Alex for the rest of the season. He’s no slouch. We talk during the week. He knows me, and I know him. He doesn’t even have to say anything. I can tell when he’s hangry, if he hasn’t eaten anything. It’s good. As far as 450 stuff, we’ll see. Right now, we’re focused on one thing, and that’s right now. We’re not worried about the future of the 450 stuff. A. Martin: With Ryan leaving the sport, it definitely leaves a big hole, especially for Minnesota and him being a great ambassador for the sport. Jeremy and I try our best to represent Minnesota. That will be our home. We always look forward to going back to Minnesota, so for Millville. We’re doing our thing and grinding day-to-day and just trying to make Minnesota look good and be good on and off the track. It’s all about being a good person on and off the track, so that’s all we can do, I guess. First break in the series comes up this week. What’s the plan for the week off? Cooper: I’m pumped. I just got a podium, first career podium. And I’m sick, so I’m going to need it. J. Martin: Just train and then take the weekend off and enjoy not having to catch a flight. I’m sure you guys are looking forward to that, too. A. Martin: I’m just excited to get back to Florida. I’ve been in California for almost two months now. Looking forward to the easy commute to Baker’s Factory. Maybe it will be an occasional cow in the way instead of a four-car pileup and a motorcycle down on the 91 freeway. For me, I’m just looking forward to some greenery, maybe taking the kayak out for a spin with Kels and the lakes, maybe doing a little fishing. It will be business as usual. Day off, and then we’re kind of back to grinding. Looking forward to it.